Poh (third left) and Lam (fifth right) pose with the organising committee and LSC staff during the sponsorship presentation. 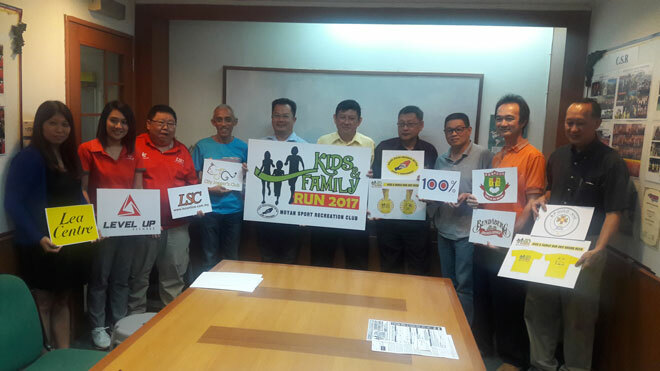 KUCHING: SJK Chung Hua Sungai Moyan and Kelab Sukan Rekreasi Moyan will be organising the ‘Kids & Family Run’ in collaboration with Lea Sports Centre (LSC), City Jogger’s Club, BP Guild – KHS, 100% Super Store Sungai Moyan, Supreme Cold Storage Food Supply and Level Up Fitness. Kelab Sukan Rekreasi Moyan president Alex Lam said the charity event, to be held on Nov 11, is aimed at raising funds to purchase educational material, equipment and computers as well as to improve the school facilities. “We are targeting to raise RM50,000 from the event and we expect about 1,500 participants to turn up at the event at SJK Chung Hua Sungai Moyan on Nov 11. “The 3km run will start at 6.30am and end at the school car park and we are targeting students and parents from 10 schools in Batu Kawa area for the run,” he told reporters at a press conference at LSC headquarters at Wisma Hopoh yesterday. The schools are SJK Chung Hua Batu Kawa, SJK Chung Hua Kim Choo Seng, SJK Chung Hua Pangkalan Baru, SJK Chung Hua Rantau Panjang, SJK Chung Hua Sejijak, SJK Chung Hua Sungai Moyan, SJK Chung Hua Sungai Tapang Ulu, SJK Chung Hua Sungai Tengah, SJK Chung Hua Stapok and SJK Chung Hua Syn San Tu. Registration fee is RM35 per person and every participant will receive a rack pack containing running T-shirt and a running bib with special numbering which enable them to have the chance to win lucky draw prizes. They will also receive a custom-made finisher medal. Entry forms can be obtained from LSC outlets in Kuching, 100% Super Store Sungai Moyan outlet and Batu Kawah assemblyman Dr Sim Kui Hian’s Service Centre. The closing date is Oct 31. Sim, who is the Minister of Local Government and Housing, is expected to perform the flag-off. Meanwhile, LSC senior operations manager Poh Siok Hoon said LSC is proud to step in and support this event by giving a sponsorship of RM10,000 including providing attire for the technical team, mineral water and lucky draw prizes worth RM2,000. “Other sponsors coming in to support this event include City Jogger’s Club who will be providing the technical support and equipment, Level Up Fitness to conduct a Zumba workout session while 100% Super Store Sungai Moyan, Supreme Cold Storage Food Supply will be providing light refreshment,” she added. LSC is also responsible for the production of the publicity displays for the event throughout Kuching city. For more details, contact Alex Lam (013-8388193), club secretary Thian Phin Kong (019-8588013), councillor Jong Tien Kiong (013-8029061) and Lai Shu Ngin (013-8086165).